Enhanced with a protective formula, OSiS Session Extreme Hold Hairspray shields against UV rays whilst protecting against humidity, so no more frizz! It’s super strong control power allows your hair to be moulded after spraying and brushes out easily. 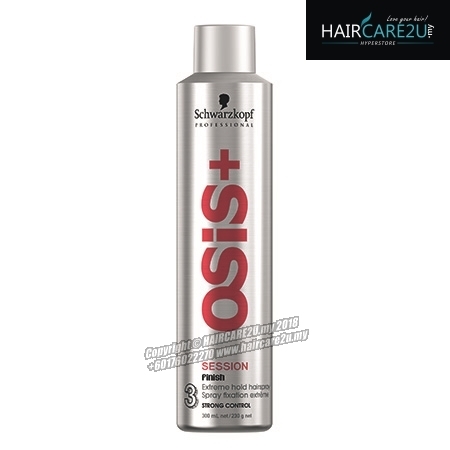 OSiS+ Session Finish provides your hair with ultra long lasting hold. It’s a non-sticky hairspray with fast drying formula for instant fixation. Session has an OSiS+ Control Level of 3 for maximum style moulding and definition. This hairspray is ideal for strong control when styling your long hair up. Hold approximately 30cm away from hair. Spray evenly.